Providing access to public transportation is a key priority in the City of Tampa as officials to expand options for residents and visitors. This spring, HART launched the HyperLink. This innovative transit solution allows their network to come direct to your doorstep. 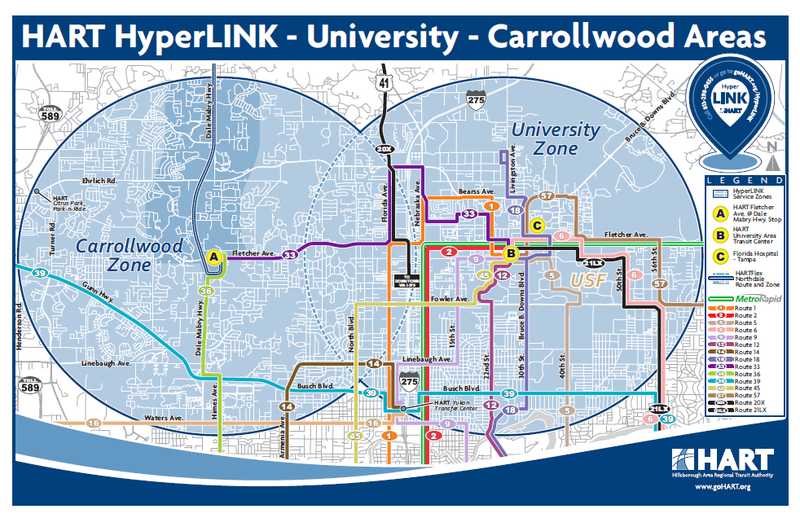 The HyperLink delivers rides to and from local bus stops for passengers in the University, Carrollwood areas, and Brandon. The state subsidized pilot program means passengers pay a low fare for each trip — only $3 each way. The HyperLink app is available on both Apple and Android phones. Rides can also be booked by calling 813.298.0455. HyperLink cars operate 30 minutes before and after service in the designated zone begins. Riders are able to book trips with up to four passengers. For return trips, riders are encouraged to book their HyperLink vehicle ten minutes before arriving at their stop. The University area of Tampa features a fleet of Tesla Model X vehicles bringing students to HART’s main transportation hubs from the Marshall Center. HART’s HyperLINK is incredibly important to the Tampa Innovation Alliance and we are proud to be the first place in the United States where this kind of partnership between rideshare and public transit is taking place. We are tackling real challenges for the people in our community with technology and innovation. The new seven-seat fleet will come with the hardware needed for full self-driving capability and 289 miles of range on a single battery charge. Charging stations will be installed in the Innovation District to keep the vehicles fully charged. Learn more about our local transportation system by following HART on Facebook, Twitter and Youtube. Through August 31, HART offers a Summer Blast Pass. Riders, ages 5-18, enjoy unlimited rides for just $30.